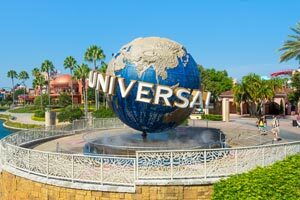 With a stay at Crowne Plaza Orlando Universal in Orlando (Sand Lake), you'll be a 4-minute drive from Orange County Convention Center and 5 minutes from Pointe Orlando. This 4-star hotel is 1.9 mi (3 km) from Universal CityWalk™ and 2.6 mi (4.2 km) from Orlando International Premium Outlets. Make yourself at home in one of the 400 air-conditioned rooms featuring microwaves and LCD televisions. Your pillowtop bed comes with premium bedding. Complimentary wired and wireless Internet access keeps you connected, and digital programming provides entertainment. Private bathrooms with shower/tub combinations feature complimentary toiletries and hair dryers. Enjoy recreational amenities such as an outdoor pool and a 24-hour fitness center. Additional features at this hotel include complimentary wireless Internet access, concierge services, and gift shops/newsstands. If you're planning a day at a nearby theme park, you can hop on the complimentary shuttle. Enjoy American cuisine at Elements Bar and Grille, a restaurant which features a bar and a pool view. You can also stay in and take advantage of the 24-hour room service. Relax with a refreshing drink from the poolside bar or one of the 2 bars/lounges. Buffet breakfasts are available daily from 6:30 AM to 10:30 AM for a fee. The preferred airport for Crowne Plaza Orlando Universal is Orlando, FL (MCO-Orlando Intl. ).